Do you scrapbook? Do you Project Life? I wrote all about Project Life and how it made my scrapbooking so much easier. I have two young children yet I have easily scrapbooked every week of their lives with this system. 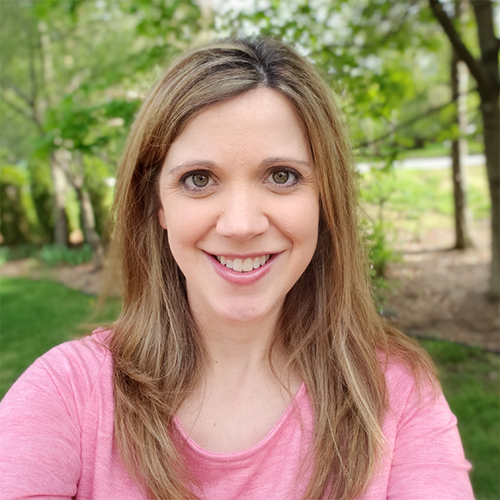 If you want to know more background about Project Life, check out my original post in this series HERE or the supplies needed HERE. 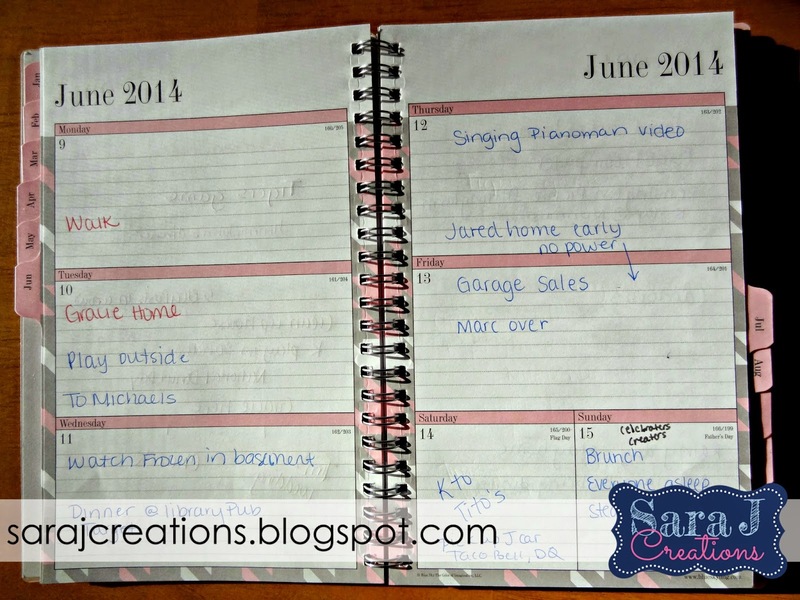 This week my focus is how to stay up to date in your scrapbook. 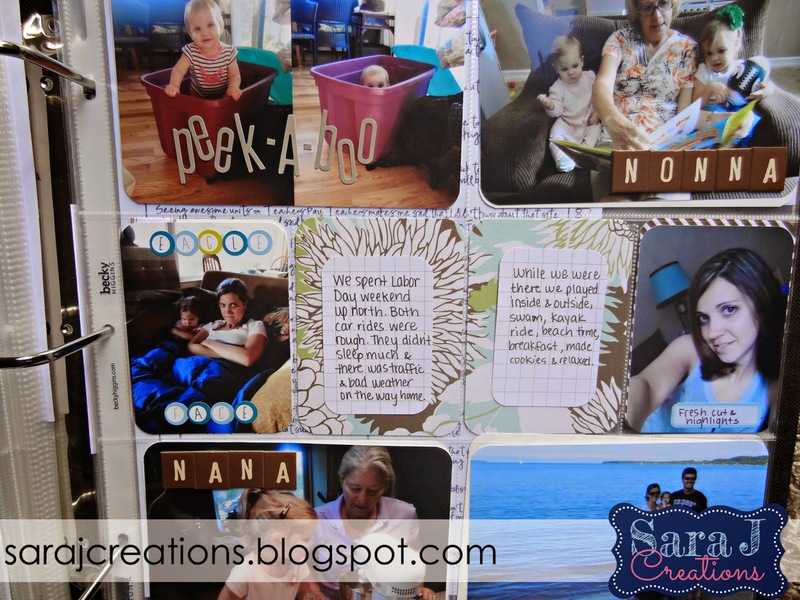 The idea of using Project Life for a weekly scrapbooking layout can be overwhelming. 52 layouts in a year? Seems like a lot with everything else on your plate, right? I completely understand because I felt the same way when I first discovered Project Life. I had a baby on the way and I was worried that I wouldn't be able to keep up with a scrapbook like this if I started it. But at the same time I get annoyed when I start something and don't finish it, so would that be the motivation I needed to keep going? Let me assure you, it can be done! This will be my 4th year documenting our daily life using Project Life and I think the most I've been behind was about a month after K was first born and I was trying to get used to parenthood and scrapbooking. The first year I would sometimes have to do two weeks at a time but now I am almost always caught up and only have to scrap one week at a time. 1. Document our week using my camera and my phone - kind of obvious, right? You need to take pictures. I've gotten used to taking more pictures than ever before and especially focusing on the real life day to day stuff. Our scrapbook isn't all happy and perfect. It is real and messy. There are pictures of my daughter throwing a temper tantrum, piles of laundry, our family room trashed with toys and more. I just take as many pictures as I can throughout the week. 2. 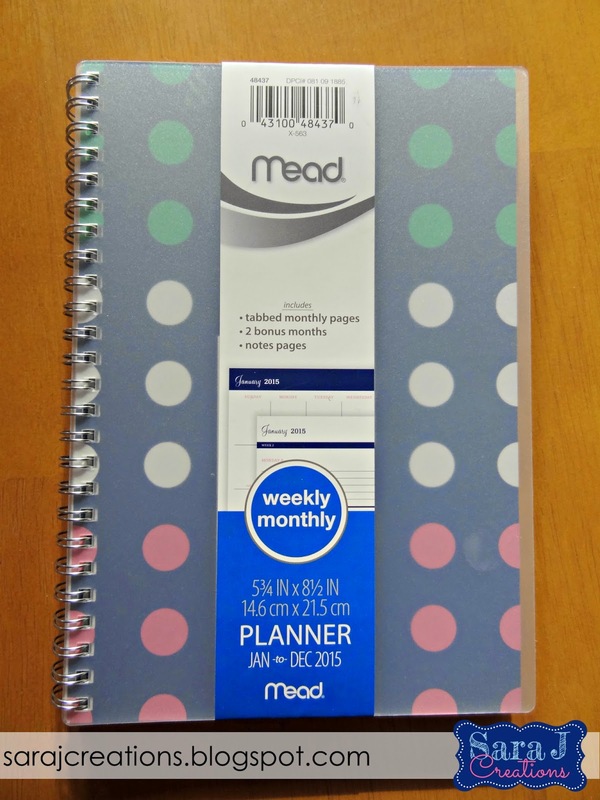 Jot down notes about our week - I've used a few different organization methods to keep track of what we do throughout the week but what has worked best for me has been to keep a small planner on my kitchen counter. I like the kind that has a weekly spread so that I can write down what we do each day. This is also a spot that I write down things my kids say, milestones they hit, highs & lows, what we do, etc. I also put memorabilia from our week in the calendar - receipts, price tags, stickers, pictures the kids make, awards, certificates, etc. 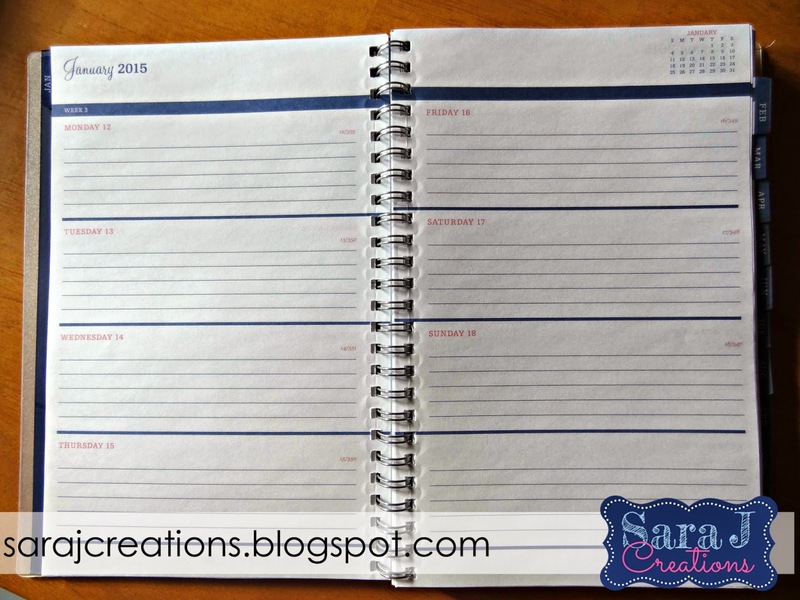 Then when I go to scrap the week, I bring my planner with me to remind me what we did and what is important enough to go in the scrapbook and decide what memorabilia I want to include. This year's planner...the colors just spoke to me! Ha!! Couldn't have matched my blog any better. I love the plastic cover because I keep this in the kitchen so it has the chance to get spilled on. 3. 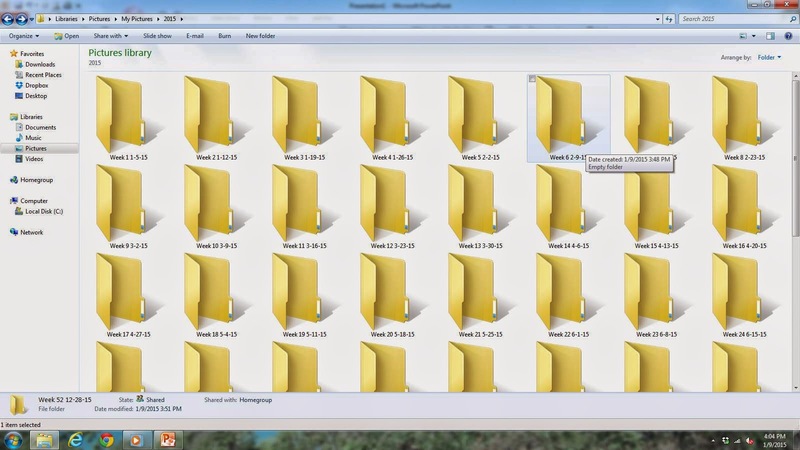 Transfer all pictures to my computer into a file organized by week - I plug in my phone and camera into my computer once a week and transfer all my pictures over. I save them all in a file by week so they are easy to find. This year, I thought ahead and made files for the entire year because for some reason, this part annoyed me each week...needing to figure out the date and create a new folder each time. I go through my pictures and delete the bad ones. With a 1 and 3 year old, I need to take LOTS of pictures to get one good shot. They are in constant motion so I often get a lot of blurry pictures. Now is the time that I go through and delete what I don't want. I also create a sub folder that says "To Print." In this folder I drag the pictures that I decide I want to put in the scrapbook for the week. One thing that has helped me a TON with transferring pictures is the Dropbox app. I recently put it on my phone, tablet and my computer. Now I don't have to use cords to transfer pictures. I just put them in the app and they show up on the computer. 4. Print those pictures out...FAST - the first few years that I did Project Life, I relied on stores to print my pictures. I would occasionally order from Shutterfly when there was a sale but more often than not, I uploaded online and ordered from Costco or Walmart. This system worked and was probably the most cost effective but I think this is what caused me to get behind. I would often wait and print a few weeks out at a time so that I didn't have to make a weekly trip to Costco with a little one. Not having the pictures ready when I needed them definitely slowed down the process for me. You can make it work. I probably could have been better about ordering every week and picking them up regularly but it seemed like there were so many things out of my control like delays in printing, broken equipment, etc. Enter the Canon Selphy. I'd read about this little gem and put it on my wish list. I got it for my birthday a few years ago and it changed my scrapbooking life COMPLETELY. I now have the power to print at home whenever I want. It prints 4x6 pictures wirelessly from my computer. It uses Dye-sublimation technology that uses heat to transfer ink to paper. While I don't fully understand that whole process, I do know that it means there is no ink to smear, there is no wait time, your pictures can be used instantly. Awesome!! And it uses cartridges that print an exact amount of pages. It isn't like your normal printer that starts to run out of ink and the pages become more and more faded. It prints with the same quality until the cartridge is empty. You have to buy the ink and paper refill kit (you can't use your own.) The refill is usually about $30 and it prints exactly 108 pictures. That works out to about 28 cents a picture. This is definitely more than most stores will print them for around here but to me it is worth the extra cost to get my pictures instantly when I'm ready to scrapbook. 5. Get scraping - I try to sit down and scrapbook the previous week on Monday or Tuesday when everything is still fresh. Some weeks I have more time and add more embellishments. Some weeks it is the bare minimum - put the pictures in, add the journaling, done. I can usually get the scrapbooking done in a half hour if I am not doing any extra embellishments. I think the longest part is going through my pictures and deciding what I want to print for the week. 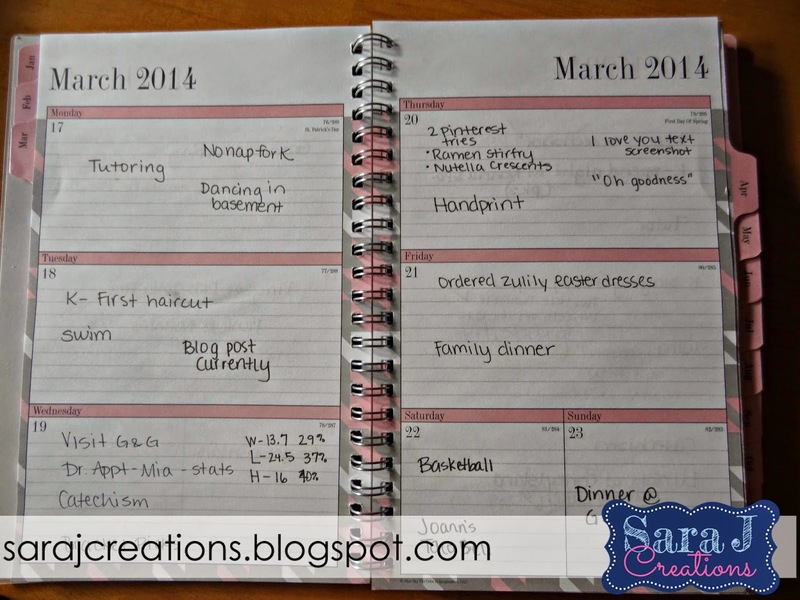 This is the process I go through each week that has allowed me to keep up to date with our weekly scrapbooking. If you have any questions about Project Life, let me know and I'll try to answer them in future posts in this series. I am in no way affiliated with Project Life and am NOT being paid to promote their products. I just absolutely love their product. It has changed my life and I want to share it in hopes of others learning about it so that more of us can document our lives and memories in the easiest possible way! I have included Amazon Affiliate links for your shopping convenience. Sara, I kept up with your project life posts, but have just spent all morning going back through them and adding to my wishlist. My husband and I just found out we are expecting and I can't WAIT to use this method of memory keeping instead of the dreaded baby book I KNOW I will never keep up with. I had never heard of PL before reading about it on your blog, and I am so excited to begin! Thank you!!! Congrats on your new little one! Such exciting news. Project Life is going to be perfect for you. 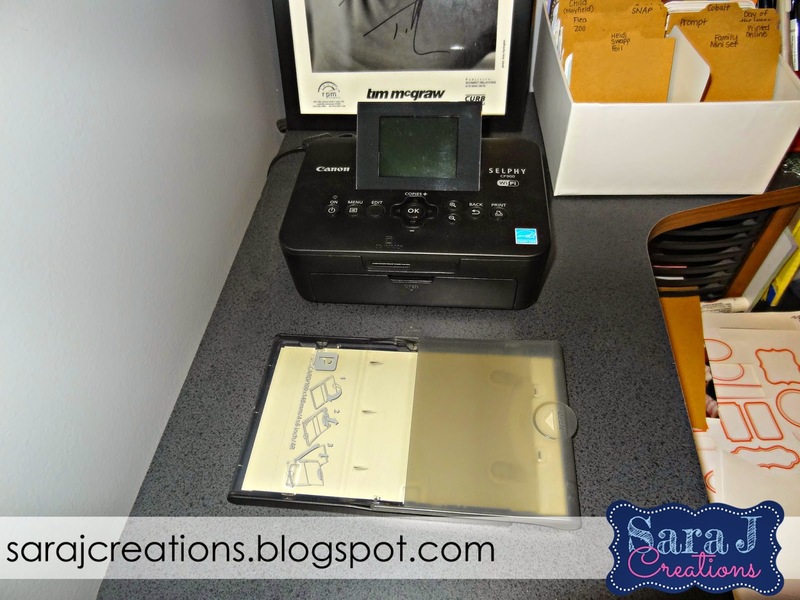 It is seriously so easy to keep up with...especially if you can print pictures from home. That has really saved me. Check out www.beckyhiggins.com for all the lastest designs. Amazon has some but they are selling all of them directly from their site. And I heard there are brand new baby editions that are exclusive to Michael's store. Check it out and let me know if you have any questions.